Julie Andrews (no, she's not Jewish), has made a lot of movies, and The Sound of Music is probably the one she's most associated with. Thoroughly Modern Millie probably doesn't ring a bell for most of our readers. After all, it was released in 1967. Millie is a small-town girl who comes to New York during the "roaring twenties" in search of a secretarial job and an unattached boss. Before you can say "23 skidoo," Millie befriends fellow single girl Mary Tyler Moore and comes across a white slavery plot run by a hysterically funny Beatrice Lillie. Sammy Cahn and Jimmy Van Heusen contributed to the tuneful score. Netflix calls it a feel-good, goofy romantic comedy. So what's it doing in Jewish Humor Central? It's all about seeing something familiar in unexpected surroundings. Just yesterday we posted a video of Daniel Ahaviel, dressed like the Chasid he is, fiddling a lively medley of Irish tunes in a performance worthy of Riverdance. In today's post the roles are reversed. Millie is noteworthy to us for a segment that takes place at a wedding, where Andrews, as a guest, suddenly starts singing in Yiddish. We hope you'll laugh as much as we did. Enjoy! 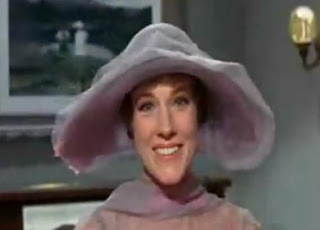 Great clip, great film and great performance from the wonderful Julie Andrews. Just a slight correction though. It's not strictly true to say that 'Thoroughly Modern Millie' didn't get great reviews. It was quite warmly received and several major newspaper critics, including Bosley Crowther of the NY Times, gave it raves. Moreover, it was a huge hit with audiences. While not enjoying the stratospheric success of Andrews other films of the time such as "The Sound of Music" and "Mary Poppins", it was the most successful film in Universal Studios' history to that date and became the 7th most popular film musical of the 1960s. "A few faults? Yes. There is an insertion of a Jewish wedding scene—with a Yiddish song sung by Miss Andrews—which is phony and gratuitous. There's a melodramatic mishmash towards the end, which has Mr. Fox dressing up like a girl and acting kittenish. That is tasteless and humorless. And the whole thing's too long. If they'll just cut out some of those needless things, all the faults will be corrected and it'll be a joy all the way." The film was nominated for seven Academy Awards and five Golden Globes. Carol Channing won the Golden Globe for Best Supporting Actress and Elmer Bernstein won an Oscar for Best Original Musical Score. Crowther says the Jewish wedding scene is gratuitous? Cross-dressing is tasteless and humorless? I'll tell you what's gratuitous, tasteless, and humorless, it's the scene at the end where the Chinese people are tossed around like cartoon animals. I find every scene involving Chinese people in this film to be disturbing. neat cinema tricks...esp. the "silent film" quotes that keep popping up on screen. As for the Jewish wedding scene, nit to contradict this site but Julie Andrews isn't "just a guest" since she mentions to Mary Tyler Moore that she's singing at the wedding while they're still at the hotel. "Promise you'll make your way back to this sea of booze and jazz."